Dashiell A. Snow aka ‘Dash Snow’, born in New York on July 27, 1981 was pronounced dead on July 13 due to a supposed heroin overdose. 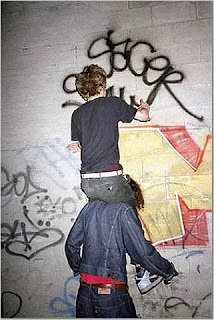 The New York sub-culture figure, controversial artist and graffiti writer began his life on the streets at age 13, stealing a camera to photograph moments of drunken outings he would otherwise not remember when sober. At 15 he founded the graffiti crew IRAK, specialising in tagging and theft (to ‘rack’ is graffiti slang meaning to steal), daubing his tag “Sace”, over and over on the walls of New York.